JTM Products has the ability to customize formulations for lubricants and soaps to meet specific customer needs. 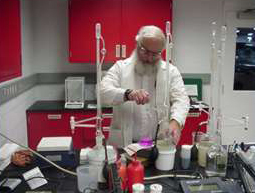 JTM chemists are experts in developing products and have the state-of-the-art technical equipment to get the job done. Each new product is lab-created and field-tested. Our understanding of soap chemistry allows us to develop application-specific products such as: cleaners, mold release lubricants, rubber slab dips, and drawing and stamping compounds. Contact JTM Products for all your formulating needs. Contact a JTM Products Sales Professional for information about our Contract Blending Services for soaps and lubricants. We will be happy to discuss your private labeling needs, including specialty packaging.